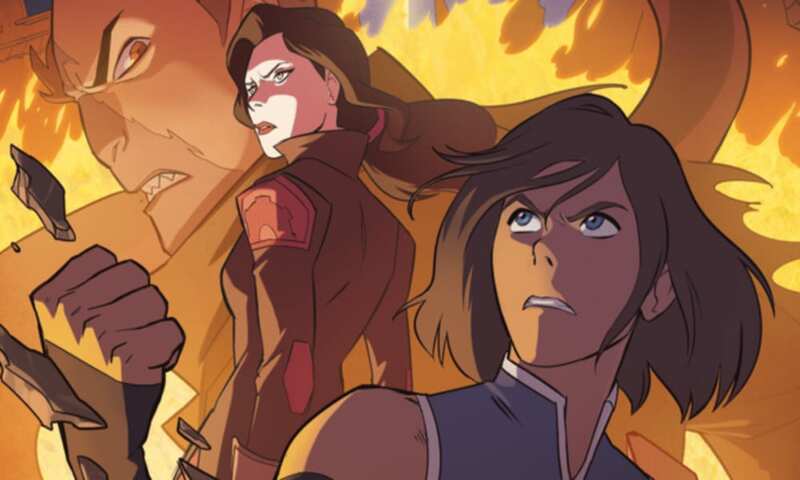 There’s no hiding it—most of us here at The Fandomentals haven’t been particularly taken by the debut graphic novel trilogy for The Legend of Korra. We love Korrasami, of course, so it rocks to see more of them individually and as a couple. We love all these characters and love seeing more of them. LoK is a Fandomentals favorite for a good reason, and we still end up talking about it after all this time. So trust me when I say that the last thing I want to write here is that I’m entirely indifferent to Turf Wars. And quite a bit disappointed by my indifference. But here we are, and here I am. Turf Wars…basically just exists. I guess it’s up to each individual person to decide if that’s enough. You know what, let’s be honest. Turf Wars exists because Korrasami was incredible and validating and people wanted more. I certainly did. So the idea was to give us more Korrasami. And…that’s basically the only thing Turf Wars does. It gives you Korrasami moments. I might be okay with that if everything around Korra and Asami, and their characters, too, weren’t such a hot mess. With part 3, Turf Wars basically confirmed every worry I had after my review for part 2. I hate to be so bluntly negative about it, but the plot for this trilogy disappointed me on just about every level. I don’t think it’s bad, by any means. Just…unremarkable. There’s really nothing here I would recommend outside of Korrasami moments and what I hope is an introduction to larger Jargala involvement in future LoK graphic novels. Part 3 basically functions as a large action scene as Korra tries to rescue Asami and together they stop Tokuga. Hey, nothing wrong with that. Give the people what they want. It just didn’t do it for me. Tokuga was never much of a threat to Korra. I found it hard to really invest myself in what was happening. Then again, I admit this has as much to do with my own adjusted expectations following the first two volumes as it did with anything Turf Wars part 3 did wrong. In the end, I just didn’t care all that much. As indifferent as I was throughout part 3, though, I was also bitter to see Turf Wars fulfill so many of my biggest worries after part 2. How does the presidential election go down? Raiko does something scummy, Zhu Li has one hero moment, and that’s it. Zhu Li wins. What happens with the spirits? Basically nothing. Korra says a couple lines and they go back and there you go. Tokuga has some randomly evil plot so he can be some completely one-dimensional villain for the heroes to beat. Turf Wars set up like 4 or 5 different plots, tried to cram them into one climax, and they all suffered for it. I was pretty sure going in that Tokuga would turn out this disappointingly, but I’m still disappointed. I felt literally no tension from anything he did. When Korra says that she and Asami have been in tough spots but that this feels different, I totally agree…just not in the way she meant. That line is meant to imply that this feels more threatening than usual. Yeah, no. It was different in that I literally felt no danger towards anyone. Tokuga was a character that would have worked if the spirit portal plot existed alone. There could have been genuine exploration of what the spirits did to him and what that meant for the new spirit portal in Republic City. What happened to him was messed up. He could have used consolidation of the Triads as a power base for an actual run at Raiko’s presidency. He could have gathered the masses against the spirits and made Korra serve as the bridge between the human and spirit worlds. There also could have been further opportunities for Tokuga to actually do things building him up as a threat. Instead he was just stock-issue evil guy who nearly poisons the city. Except you never feel like he had any chance of succeeding. I will admit to being wrong about one thing—I thought Asami would have nothing meaningful in part 3. I assumed her role was to be rescued by Korra. She not only escaped on her own, she basically prevented Tokuga’s plot by herself. After a part 2 that saw a…different interpretation of Asami, it was good to see her act more like herself. She got a moment about her father, finally. She used her engineering smarts to save the day (and crashed another vehicle). As disappointed and ultimately indifferent as I am with Turf Wars part 3, I’m glad to see this Asami again. By far my biggest problem with part 2 was her and Korra. They both felt so out of character. Still, what exactly was the growth or character arc here, for either of them? That they eventually say they love each other? As squee-worthy as that moment may be, we already knew that. And I’m not going to put that moment down. Two women said they love each other romantically in a graphic novel aimed at a young audience; that’s important and I love it. Hooray for happy wlw endings! Does it constitute a character arc, though? I don’t believe so. Neither Korra or Asami faced any new challenge or circumstance forcing them to change or learn anything new. They’re the exact same people they would have been if Turf Wars didn’t exist. When the two characters these comics literally exist for don’t undergo a character arc, that’s a problem. And it’s a problem emblematic throughout the entire trilogy. Did any character have a character arc? Even one? Bolin and Mako sure don’t. The airbenders don’t. Korra and Asami kind of do, but without much execution or actual arc involved. Tokuga might honestly have the closest thing to a character arc, where he devolves into Bond-esque villainy. Zhu Li ends up in a vastly different position compared to the beginning of Turf Wars, but there was no arc involved. She just ends up president without any real strife to overcome or development involved. She functions as a plot device, rather than having anything happen that actually makes her act the way she does. Actually, you know who had the most character development? Keum. He had a pretty substantial journey from money-grubbing CEO building a Spirit Wilds amusement park to good guy helping protect the Spirit Portal. The ultimate goal of any good story should to make some point or define some character. If your story involves returning characters, then you need to do something that further defines what we already know. Something needs to change. However you feel about The Legend of Korra as a whole, you never doubted the larger growth and character arcs involved. Every season contributed to the development of everyone featured. Even Asami, as sidelined as she could unfortunately be for fans of hers, always walked away from each season in a different place than when she started. Book 1 firmly plants her on Korra’s side and puts her in charge of her company. Book 2 has her struggle with these developments. Book 3 grows her relationship with Korra. Book 4, as frustratingly limited as it might feel as a fan, deals with her abandonment issues as she navigates the return of both Korra and her father. 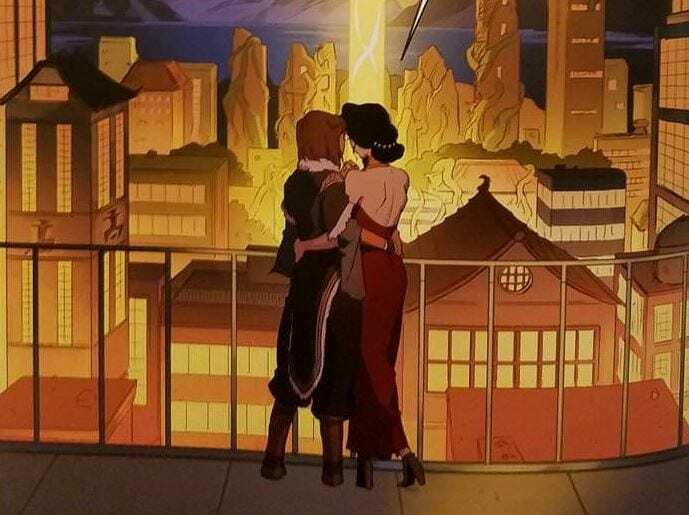 I feel like this type of development would be especially in focus within Turf Wars when one of the selling points of the trilogy was Korra and Asami’s relationship. How did this relationship change them? What does it mean for their lives? Is there anything here they haven’t been through before that changes who they are? Anything that informs on them in some new way? I don’t believe so. Maybe others disagree with me. But in my case, it seems like a huge missed opportunity. Part 3, despite featuring a lot of Korra, makes her feel almost invisible to me. She has no function within this volume outside of fighting Tokuga and telling Asami she loves her. Overall, I wonder what storyline here had any real point to it? Again, this falls back on the decision to try and fit so many storylines into three volumes. Maybe there was some larger point they intended to make with Turf Wars, but whatever it was, it fell flat or didn’t exist. I mentioned in my review for part 2 how each of the various subplots could have carried their own trilogy, or even mixed together. The Triad storyline and the presidential election could fit together. Tokuga and the spirits could, with a dose of Korrasami mixed in. Whatever we think of its plausibility, the homophobia mentioned in part 1 could have mixed in with any of this, as Korra and Asami deal with public perception of their relationship and how it hurts their efforts in any of these storylines. Instead none of this came together. Homophobia flat out didn’t exist past the first comic, so what was the point of mentioning it? Tonraq is called out for not supporting Korra’s relationship, I guess, even though that’s literally the exact opposite of what happened. If you’re going to bother injecting homophobia into the LoK universe, you need to follow up on it. The Creeping Crystals kind of matter, but not really. Mako and Bolin might as well not exist (with Bolin not even speaking for almost the entirety of this issue). The presidential election was half-hearted and poorly executed. So was the spirit plot and the airbender protest. And does anyone even remember that Republic City is destroyed and thousands of refugees need homes? Talk about dropping a storyline like a ton of bricks. Really, the only intention here seemed to involve getting everyone at the spirit portal for Tokuga’s poison gas to threaten them. Once that happened everything else just fell away. Though I’d also say the theory of Varrick engineering everything seems more plausible. Oh sure, he just happens to have a docu-mover crew there to see all this go down, all coincidentally. Right. Even the character interactions, which gave me some genuine enjoyment in the first two parts, were relatively nonexistent for part 3. Everything was so centered on Tokuga’s threat that everyone else played a backseat. Even Korra did, as she was basically just chasing Tokuga around to save Asami. And when I didn’t buy into Tokuga as a threat, well…I’m probably not going to buy in to this volume all that much. I’d have rather watched Asami design apartment buildings while Korra dealt with the displaced masses. But maybe I’m weird like that. Plus there’s not really much of an ending to anything. The spirits basically confirm that they will be back. Tokuga is still around and will be back unless he’s so unpopular that they drop him. Raiko’s last panel is him staring out a window in a way you can read either as resignation or scheming. Republic City is no closer to being rebuilt than before. It hurts when there was no real resolution to so many of the plots throughout the trilogy. The presidential race has an ending. Korra and Asami, too. That’s about it. Turf Wars was all about Korrasami moments. I suppose your mileage depends on how much you care about everything else compared to those moments. You know what? It is not my place to say whether this is really enough or not, because this comic wasn’t made just for me. Hell, it wasn’t made for me at all. Turf Wars was created for those tearful fans posting reaction videos on YouTube in the aftermath of the LoK finale. It was meant for the people who sent Bryke the Korrasami Project. From what I see, they love Turf Wars. Whatever my opinions about it, I’ll leave the ultimate judging to those fans. This was a love letter to them, a thank you for all the love poured Bryke’s way by a very grateful community. The reaction to Korrasami was so genuine, emotional, and thankful that it couldn’t help but pull fringe supporters like myself in. I can’t even imagine how it felt for Bryke and everyone who worked on LoK to receive such overwhelmingly positive support in the aftermath of the finale. If they want to give back to those fans and worry about everyone else later, good for them. I fully accept that. Not everything has to be aimed at everyone. Sometimes, a story exists just for certain people and if they like it, that’s all that matters. It’s unequivocally awesome to have Korra and Asami’s relationship so out there now, with kisses and I Love Yous and a complete lack of ambiguity. It always matters to have more representation. My feelings on Turf Wars are no ultimate judge of the trilogy and in no way are meant to invalidate those who love it. I’m so, so happy for everyone who does. If everyone else can have flawed entertainment aimed at them, then why not the LGBTQ+ community as well? Ultimately, Turf Wars is what it is; a relatively stress-free comic with a lot of flaws that aimed to give Korrasami fans more of the couple we love. On that end, it delivered. We got their Spirit World vacation, the reactions of those close to them, confirmed lesbian Kya and bisexual Kyoshi, Korrasami kisses, proclamations of love, and a final volume that saw both women work together to take down the bad guy. If there was one major regret about Korrasami in the aftermath of the Book 4 finale, it was the missed chance to really make Korrasami explicit. Both Bryke and the fans lamented missing the chance to end with a kiss and permanently shut up everyone who spent 4 seasons mocking the idea of Korrasami. Now we have the kiss and then some. Korrasami was a trailblazer in LGBTQ+ representation in children’s media and TV as a whole, and Turf Wars was a nice capping point on the reality of their relationship. This may not be satisfying for everyone. I can’t say it satisfied me. But again, that’s not the point. I wasn’t the one Turf Wars set out to satisfy. Have fun, Korrasami fans. This one was for you. Here’s hoping we get more LoK and Korrasami soon, and also that the recently announced next trilogy will shore up Turf Wars’s flaws. Bo relaxes after long days of staring at computers by staring at computers some more, and feels slightly guilty over his love for Villanelle.